Given the function f (x) = 4-2x. What is the percent rate of change? Given the graph shown at the right, find an exponential function to represent this graph. Consider the graph of y = ex with the limited domain [-4,4]. What is the maximum value of the function on this interval? The graph at the right shows a function of the form f (x) = bx. Given f (x) = e3x. Find the value of ln(f (-1)). The table below shows values from an exponential function of the form f (x) = abx. Which of the following equations may be represented by this table? 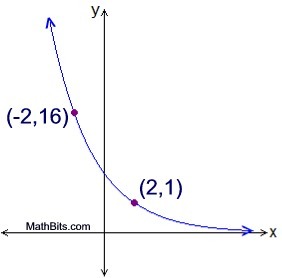 A vertical shift of the graph of y = ex changes the horizontal asymptote. What is the equation of the horizontal asymptote of the graph of y = ex+ 3? Given the graph of an increasing exponential function. a) If the equation for the graph is written as y = abx, describe what is known about the values of a and b.
b) If the equation for the graph is written as y = aekx, describe what is known about the values of a and k.